What’s believed to be the UK’s first online luxury beauty magazine has been set up in Manchester, through funding from the Government’s Start-Up loan scheme. Laura Ward-Ongley set up FabTips as a “blogzine” to combine “the authentic and straight talking tone of voice” of a blog, with the crafted content and features normally associated with glossy magazines. Targeted at busy, beauty conscious women who don’t have the time to read several magazines a month, Ward-Ongley said that its cross-platform reach is already more than 100k and has had a 246% increase in traffic over the last quarter. “Over the past decade I’ve watched the explosion of blogs across the digital landscape but I soon noticed that a lot of the beauty blogs were written by people in their 20s and that they just didn’t feel relevant to me as a 30 something ‘high flying’ career gal. “I’m not going to wear neon lipstick to a meeting and most nail art really isn’t feasible in my life, I don’t have time! Then I started to see the emergence of USA blogzines (the future of professional blogging, expect them to explode in the UK over the next 5 years), which combined the authenticity of a blog with really relevant news and features and that is very much the style I’ve used for FabTips,” explained the former advertising executive at BBH and later AMV BBDO, where she was a global account director working with Blackberry, Audi and Persil. 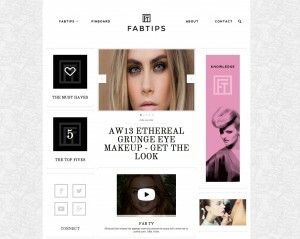 The 30-year-old from Sale first started researching FabTips a year ago, by canvassing the blogging community and her target audience of "ABC1 30+ high flying career girls". It began with a holding page blog to recruit readers and that led to her pitching (and receiving) a £10k start-up load from Business Finance Solutions. This cash was invested in building the site. “Laura is exactly the kind of person that the Start-Up Loans were designed to support. She has found a unique business idea that she is completely passionate about, understands her market inside out and is already making the concept very popular with her audience. With her own advertising background and business acumen, FabTips looks set to be a big success and we’re delighted to be able to supply the funding and business support she needed to get it up and running,” said Paul Breen, director of Business Finance Solutions.